Discussion in 'High Definition' started by zbinks, Dec 10, 2015. This classic of British horror has been painstakingly restored by VCI (with the cooperation of the British Film Institute) and is now complete and uncut; including more than 2 minutes of additional footage, which had been cut from the U.S. version, titled Horror Hotel. This also marks the first time ever this uncut version has been seen on video with its original title. THE CITY OF THE DEAD is an extraordinarily good chiller scripted by George Baxt, which still has the power to frighten fans of the horror genre. A college student, Nan Barlow is researching the history of witchcraft. Taunted by her brother and fiancé, who have voiced their concern over her silly notions, Nan arms herself with resolve and drives into the small New England village of Whitewood. She is glad that at least she was able to count on the support of her professor. A bit anxious, but consumed with curiosity, she will soon embark herself on the journey of her life! 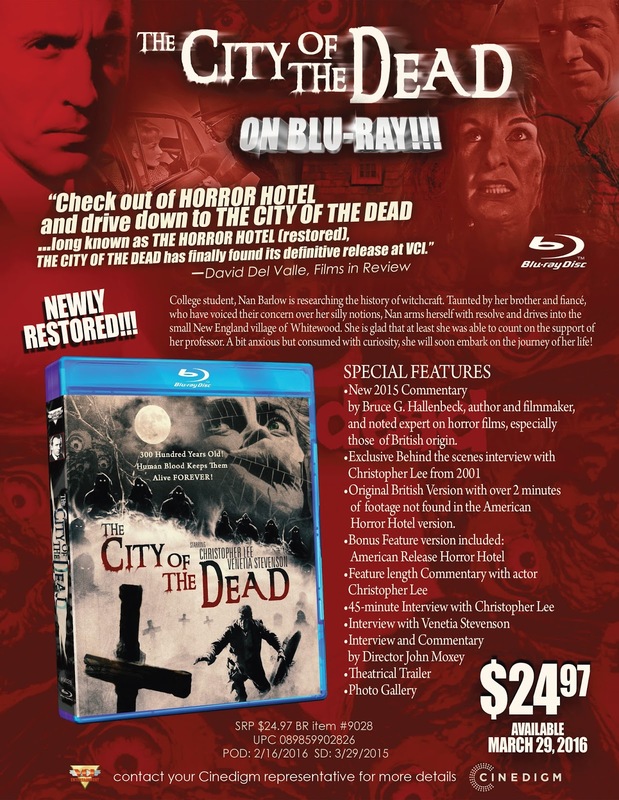 Time to reveal the final specs for our upcoming release of The City of the Dead! Check them out in full after the jump. Produced by future Amicus founders Milton Subotsky and Max Rosenberg, and beautifully shot by Desmond Dickinson (whose credits ranged from Laurence Olivier’s Hamlet to Horrors of the Black Museum), The City of the Dead is a wonderfully atmospheric and still shocking slice of horror that stands firmly alongside its Hammer contemporaries. Understatement: This looks like it will be a dramatic upgrade over last year's extremely disappointing VCI release. I finally got around to watching Horror Hotel aka The City Of The Dead via a recent TCM airing. I'm hit or miss when it comes to pre-'70s movies, but I thought this was amazing! So beautiful, creepy, and atmospheric! The scenes of driving in the fog and you keep catching glimpses of people through the fog... so spooky! Terrific movie, I was riveted. I need to buy the blu-ray because I already want to watch it again. You know how Messiah Of Evil is punctuated by those amazing stalking scenes (the supermarket, the movie theater, etc)? This was basically Messiah Of Evil: Just The Good Stuff. Yup! It's a great movie. I have the most recent VCI edition, not sure if I want the Arrow as well.